The radio telescope array of the Canadian Hydrogen Intensity Mapping Experiment will measure a broad expanse of space to see how the universe expanded over billions of years of its early history. Sometimes, exploring the history and fate of the universe requires special skills. "I just took tractor lessons this morning – for keeping the grass down," says Mark Halpern, a professor of astrophysics at the University of British Columbia. Dr. Halpern's boots crunch on the gravel at the Dominion Radio Astrophysical Observatory in Penticton, B.C., a federal research facility operated by the National Research Council that is now the site of one of the most audacious cosmology experiments in the world. Above him rise four giant half-cylinders made of galvanized steel and mesh. Measuring 20 metres across by 100 metres long, they are open to the sky like giant eavestroughs ready to catch the rain. But what scientist are really hoping for is a downpour of data that will unlock some of the universe's deepest mysteries. The experiment goes by the name CHIME – the Canadian Hydrogen Intensity Mapping Experiment – and, after seven years from initial idea to construction, it is ready to start sifting through the subtle whispers and bleeps of radio noise that are coming our way across billions of light years of space. By doing so, it will attempt to measure how the expansion of our universe – a process that has been under way for the past 13.8 billion years – was changing at a critical time in the deep past. As a bonus, it will also pick up anything unusual happening in the cosmic foreground, and shed light on a fleeting and mysterious category of objects that astronomers have dubbed "fast radio bursts." To get there, Dr. Halpern, who is principal investigator on the project, has had to contend with a lot of earthly headaches. Grass is a big one. Once the four giant collectors were built last year, the disturbed ground beneath them, regularly watered by morning dew dripping from the steel framework, proved to be the ideal habitat for an noxious invasive species of plant known as knapweed. "For a while we had the healthiest knapweed crop in the valley," Dr. Halpern says as he clears away some dry stalks. "Now I think we're winning." The fear is that fire could sweep through the dry weed and damage some of the 110 kilometres of wiring that connects the half cylinders to a small army of water-cooled computer processors stowed in a modified shipping container nearby. The CHIME team's solution has been to cultivate native grasses that, once established, should keep the knapweed out and be relatively easy to manage. "Starlings are the worst," Dr. Halpern says, pointing to the many bird-sized cavities in the antenna structure that the team is working to block off from unwanted guests. "They nest right on our amplifiers and their babies poop on them." That, too, is a battle that scientists are gradually getting a handle on. Fortuitously, a pair of osprey that decided to build a nest overlooking CHIME also appear to be helping to keep smaller birds and rodents under control. Every bit helps for the project – a collaboration between the University of British Columbia, McGill University, the University of Toronto and the observatory – that has spent about $16-million leveraging engineering smarts and some state-of-the-art electronics in order to tackle questions that once seemed out of reach to anything but a billion-dollar facility. "We went out on a limb a little bit when we said we could do this five years ago," says Keith Vanderlinde, an experimental cosmologist with the University of Toronto's Dunlap Institute. At that time, Dr. Vanderlinde says, there was no computer system available that could realistically handle the one terabyte of information a second that would be gathered by the half cylinders – a data rate equivalent to all the world's wireless networks combined. But the team gambled on Moore's law, a rule that predicts a doubling of computer processing power every couple of years. Remarkably, by the time CHIME was built, there was enough digital muscle available – mostly because of advances in video-game-related hardware – to manage the task with 1,024 high-speed processors chugging away all together. 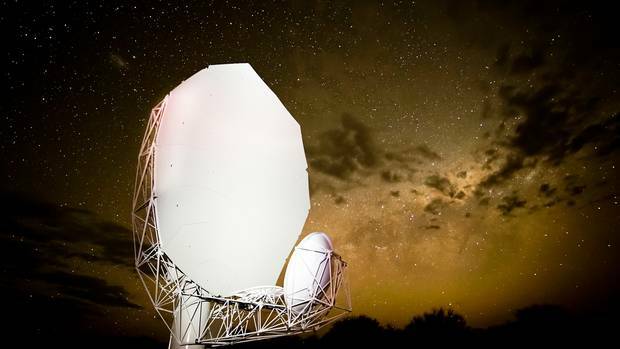 "If they can make all those hundreds of computers work, they stand a good chance of seeing something," said Danny Jacobs, an astronomer at Arizona State University who is also a commissioning scientist with another radio telescope array called HERA, based in South Africa. What astronomers hope that "something" will be is the faint hiss of hydrogen gas that occupies the vast volume of space among and between the galaxies. The gas is not evenly distributed but has a bubble-like structure in which the hydrogen tends to be concentrated along the walls of the bubbles with very little in between. Looking into the gas is like looking through a succession of walls that are roughly evenly spaced. Now add to this the idea that the universe is expanding – an inexorable process that has been under way since the Big Bang. That means the walls of gas will seem closer as CHIME looks deeper, because signals from far away take longer to reach Earth and therefore are from earlier times in the universe's history. CHIME's main goal is to measure precisely how that spacing is changing over time, particularly at the moment, between about seven billion and 11 billion years ago, when the expansion of the universe began to pick up speed. There are different possible explanations for this, all of them deeply linked to ideas about the origin and nature of our universe. One is that there is an outward pressure called dark energy that permeates all of space and that will ultimately cause the expansion to accelerate indefinitely. If CHIME can measure the acceleration with the accuracy scientists are hoping for, the experiment may be able to distinguish if this idea is correct or if some other proposed cause for the acceleration is the real one. The beauty is that CHIME can attempt this with so few moving parts. Rather than using one or more costly dishes that swivel around at different parts of the sky, it simply points up and lets nature do the rest. "It looks at a north-south strip and, as the Earth turns, it scans the sky," Dr. Halpern explains. The CHIME array, roughly the size of six NHL hockey rinks, will be looking for signs of ‘dark energy,’ a kind of energy present in the vacuum of space that is thought to accelerate the universe’s expansion. Because the experiment is receiving radio waves both night and day it is effectively making a continuous 3-D map of the universe that is refreshed every 24 hours. This turns out to be handy for reasons quite separate from cosmic acceleration, since by comparing the map from day to day, CHIME will also detect when something has changed. That means it will be ideal for spotting fast radio bursts, enigmatic but short-lived explosions of radio energy that astronomers have occasionally managed to spot popping off at random locations around the sky. What causes them is still very much a matter of debate. CHIME may settle the matter by spotting as many as a dozen fast radio bursts a day. "That will revolutionize the field," said Victoria Kaspi, the McGill University astrophysicist who is leading that part of CHIME's program. CHIME will also record every pulsar in the northern sky on a daily basis. These are the small and dense remnants of giant stars that long ago went supernova. What they leave behind are rapidly spinning cores that emit precise blips of radio energy that astronomers can use as celestial timekeepers. By monitoring these blips, CHIME may be able to use them to detect gravitational waves rippling through the galaxy. Dr. Kaspi – who will be on hand Thursday when federal Science Minister Kirsty Duncan ceremonially plugs in the final bit of CHIME's wiring (all of which has already been tested) – says that whatever CHIME finds, its existence is a testament to what a country with a comparatively modest science budget can do on its own. Dr. Jacobs says that while it remains an open question whether CHIME can deliver on its ambitious promise, radio astronomers around the world are looking on with interest. "Opening an entirely new kind of astronomical window is hard," he adds. "The vibe in the community is generally positive and I, for one, am cheering them on." 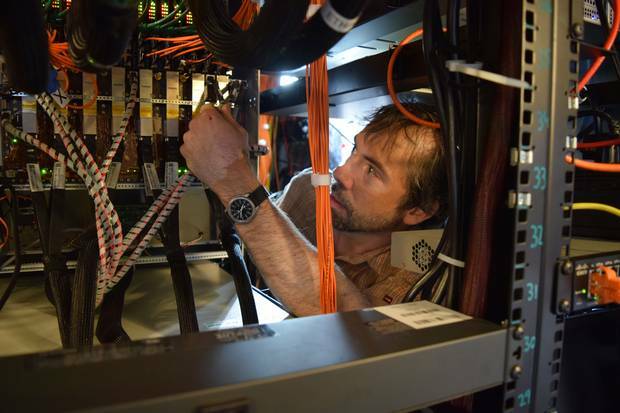 Matt Dobbs, an astrophysicist at McGill University and member of the CHIME team, works on the guts of the electronics used to process data from the experiment. 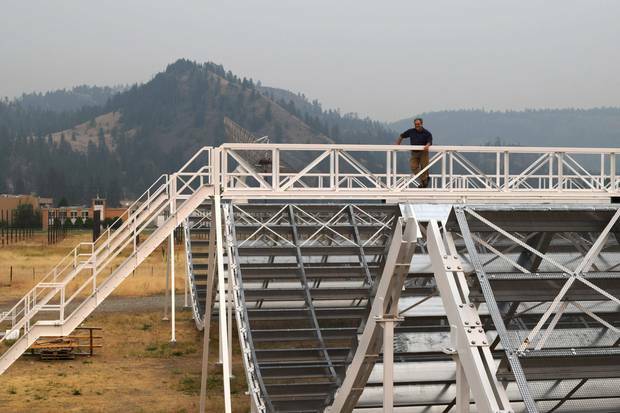 The Globe’s Ivan Semeniuk looks out at the CHIME array at the Dominion Radio Astrophysical Observatory in B.C. CHIME will be able to measure the size and spaces between large-scale structures. By picking up the radio waves from invisible clouds of hydrogen gas between the galaxies, CHIME will be able to measure the size and spaces between large-scale structures in the universe. It will also allow astronomers to see how that structure changed over time, billions of years ago, which will help determine why the expansion of the universe is accelerating – one of the most pressing questions in cosmology. Fast radio bursts could be caused by ruptures in powerfully magnetized and dense objects known as magnetars. These powerful and concentrated sources of radio energy seem to appear randomly and only last a few thousandths of a second before they fade. Some have been shown to repeat. They could be caused by collisions involving black holes or by ruptures in powerfully magnetized and dense objects known as magnetars. 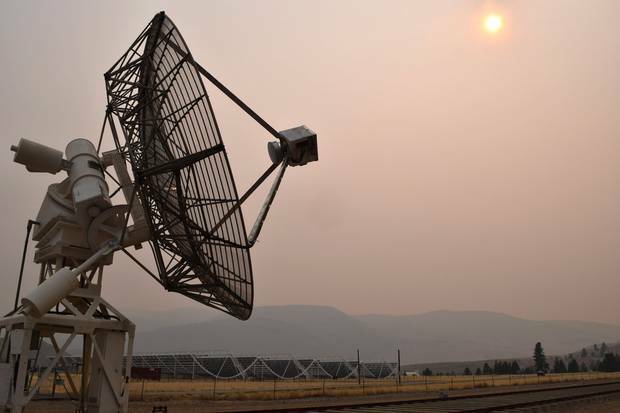 CHIME is expected to record fast radio bursts by the bucketful, which could transform the field and finally allow astronomers to work out what phenomenon or combination of phenomena are responsible. Pulsars are rapidly spinning cores that are left over from stars that went supernova. Rapidly spinning cores that are left over from stars that went supernova. Pulsars emit radio signals with such precise regularity that they can be used as clocks to time other effects, including the warping of space due to passing gravitational waves. This has never been measured using pulsars before. By observing the same set of pulsars every day as the sky sweeps overhead, CHIME could become the first experiment to do it. Where should Canada focus its telescope talents? 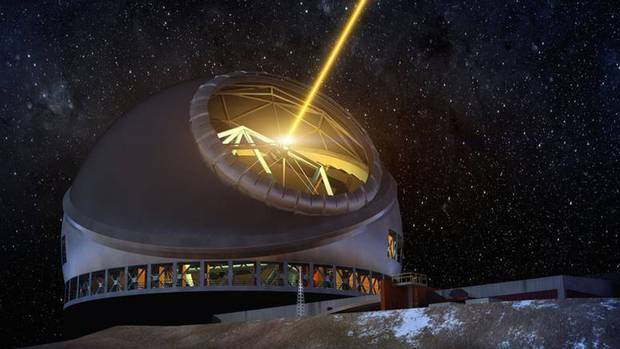 Financial and political hurdles faced by the Thirty Meter Telescope project in Hawaii illustrate how Canadian scientists are debating where to concentrate their efforts, Ivan Semeniuk explains. 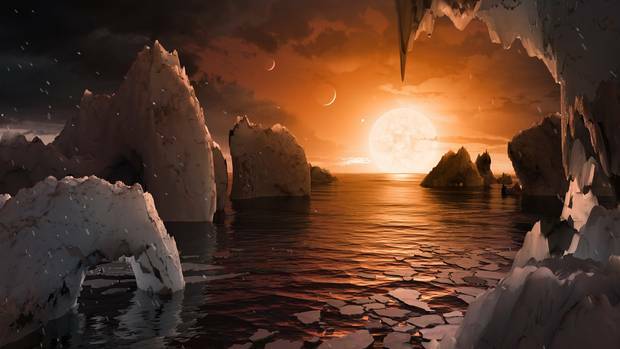 Red Dwarf and the Seven Worlds Astronomers say a solar system 39 light-years from Earth's harbours seven Earth-sized planets, at least three of which are in the temperature sweet spot where water (and potentially life) is possible, Ivan Semeniuk writes.